Other cities may go in and out of vogue, but Edinburgh will always command a place among the beautiful tourist Meccas of the world. Visit Edinburgh, Scotland’s capital city, steeped in history. The inspiring capital of Scotland is just 90 minutes’ drive from Greenock Ocean Terminal. From the ramparts of the must-see historic castle perched high on its steadfast rock, views abound of the city’s architectural delights, the firth of Forth, Calton Hill and rugged Arthur’s Seat. Experience the famous Old Town with its gritty past, the fascinating Royal Mile with its extraordinary buildings, and the Palace of Holyroodhouse, the Queen’s official residence when she visits, in a city steeped in tradition with an aura all its own. Edinburgh is also a modern, dynamic city known for its cultural attractions, galleries, performing art and international festivals. It is the UK’s second financial centre and home to the Scottish Parliament which welcomes visitors to learn about our county’s governance. Shoppers enjoy the retail delights of Princes Street and neighbouring areas with malls, high street names and speciality shops. 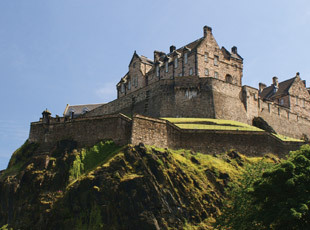 No tour of Edinburgh would be complete without exploring the fascinating fortress complex of Edinburgh Castle, Scotland’s number one paid for visitor attraction. Experienced guides offer complimentary guided tours and highlights include the Scottish Crown Jewels, the delightful St Margaret's Chapel and the Stone of Destiny on which previous Scottish Monarchs were crowned. The Palace of Holyroodhouse is another must-see, after travelling down the famous Royal Mile. Visitors can discover centuries of fascinating history in the royal apartments, the throne room and the great gallery - with over 80 17th century portraits of Scottish Monarchs. From one boat to another – cruise passengers in Edinburgh may also wish to visit the Royal Yacht Britannia permanently berthed nearby at Leith Docks. Decommissioned in 1997, the yacht belonged to Her Majesty The Queen and was used for official state occasions and private holidays by the Royal Family.